Since news at work spread about my interests in our hairier cousins, any stories remotely connected to non-human primates are immediately thrown my way. And today was no exception. I was sent down to a press conference this morning at the Wellcome Trust where a panel of experts, who took part in an independent review about bio-medical research using primates over the last tens, gave the waiting media their thoughts. As a reporter I of course had to remain impartial on a piece like this, but I have to say the findings were disappointing and left me with little hope for our nearest kin and made for quite a bleak outlook for scientific advancement. No one denies there is a need to progress with medical research, but with improved scientific technology, researchers should be looking at other methods particularly in this century. Then there’s the argument that testing on monkeys doesn’t guarantee the trials will work in us (humans) and if you put animals like this under duress, it could affect the tests so the results are not accurate anyway. Monkeys are not cheap either. Each one is thought to cost £20-25,000 and if you are doing research you need to use a lot of them to back up your research. Testing on great apes has been banned in the UK for the last 25 years. But the USA still continues. Macaques, marmosets and other prosimians, such as tree shrews, are usually the genuine pigs for research in the UK and today’s report found that one in ten studies had absolutely no medical or scientific benefit. Why on earth were they given this funding in the first place? Is this proof that vetting is not working? Will we really see a dramatic improvement in how primates are used in research in the future? It’s been hard trying to get Primatologists to talk today, mostly because everyone is on holiday or out of London. But by sheer chance, and I mean the luck of the Gods! Ian Redmond just happened to be cycling down the Euston Road late this afternoon, moments after I had just finished filming a piece-to-camera. What are the chances?? This is a man who is rarely in London and splits his time between Gloucester and Africa and lord knows what other countries in-between. I was on the phone to a dear professor who’s always been a great sounding board to me, and I rudely had to put the phone down on him in order to yell across three lanes of traffic. Thankfully Ian heard me and pulled over and proved to be the best impromptu interview I could have asked for. 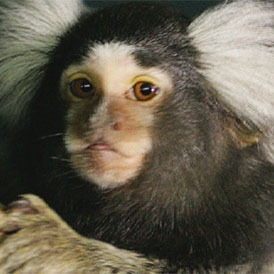 My report which was aired this evening contains some disturbing images of laboratory marmosets and is not for the faint hearted. sorry for the slightly unconventional greeting before! i do actually have an interest in these matters. What are your views on testing on humans? a hypothetical question… without prior consent? are there ANY grounds it would be at all acceptable? That’s ok, you’re not the first to sing that virtually to me, it did make me smile. Testing on humans is a hugely controversial area. Personally I think only if consent is given by the individual and they are Compos Mentis adults, then fair game. But that’s not how we operate in today’s society. If you think about other industries outside of science, like photography for example, people are made to sign consent forms to prove they were happy to be “snapped for a shot”. Papers are signed and consent forms then become legal bits of paper so that law suits can’t be brought if the image is used in a way they’re not happy about. With science, rigorous tests have to be done on animals first before it’s allowed to be used in humans. It would be deem malpractice irresponsible if that wasn’t carried out. There are never any guarantees that the drugs will work though – look what happened at Northwick Hospital – that drug worked fine on monkeys, but had devastating effects on people. If testing fails or causes irreparable harm to people then there are serious consequences for those scientists responsible. There are strict guidelines about testing on people, everything has to be trialled on animals first to ensure it is as safe as possible. As I have mentioned to Joan (see above), animals don’t have the ability to speak to us to tell us how they “feel”. Until this is possible, or until it can be scientifically proven that they “feel” in the same way we do, I’m afraid they will continue to be “lab rats”. It is difficult, but I doubt that non human primates will ever be free from testing, unless speech was developed and they could verbally protest (Planet of the Apes). There’s huge debate in science about “consciousness” and what merits “high intelligence”” in animals. If that can be empirically proved, they stand a better chance. Controversial idea about testing on human convicts. That would never happen as their Human Rights would be breached. It all boils down to ‘consent’ and animals don’t have a universal language that we understand. Sadly the failing is ours, not theirs. As usual thanks for your comment, im a bit bemused at what justifies speaking as scientific test have shown that primates can respond to words through a touch monitor and also sign language. Its so unfair when staistically 1 in 10 wasnt medically justified overall that means thousand are tested, and are suffering . In America in there universities, drug companies and other science related places how many really are suitable im sure they would be useing the science at the lowest level of exceptance not the level where the primates core concerns like housing, interaction with other primates , excersise that are not taken into consideration. Personally i dont think animals should be abused in anyway for man, we dont deserve their life taken when we are nothing more than cruel, greedy and selfish beings. They dont even get looked after in most places neither. I can recommend some “light” reading if you really want. Communication and consciousness in non human animals is a very interesting topic and has split the scientific world. There are arguments that just because animals can be taught to recognise symbols and words like “food”, “drink”, “ball”, do they really understand the meaning behind them and can they construct sentences? No evidence of this so far. The USA has an appalling record of ethics compared to the UK. During a ten year period when this study was carried out on 3,000 monkeys the USA carried out research on 60,000 primates in just one year ( I believe that’s research and testing industry). It’s good there are people like you out there, without the on-going pressure to find alternative methods, we wouldn’t progress and evolve. Here’s to a more civilised society. If you’re keen, type in ‘animal consciousness’ into google scholar. Some scientific papers you’ll be able to access for free, others unfortunately you’ll have to pay for. I’ll come back to you for some recommended reading, which you can get from good libraries or buy over the net. Some progress seems to have been made in studies of self-awareness amongst non-human primates, In a recent experiment at the University of Buffalo in the states, a research team led by psychologist Justin Couchman carried out an experiment on 40 humans and 4 Rhesus monkeys. They got all of them to individually move a computer cursor with a joystick. Simultaneously, a second cursor partially matched the movements of the first cursor. When asked to identify which of the two cursors was being directly moved by them, both humans and monkeys chose the correct one, at reportedly greater than chance levels. These findings were interpreted by the research team as meaning that the monkeys had ‘self-agency’. and were able to comprehend that it was they who were executing the movement of the first cursor, and not anyone or anything else. It would probably be rash to draw sweeping conclusions from this experiment, but it does suggest the possibility, at least, that non-human primates do experience some self-awareness. If this is the case, then perhaps they should have rights comparable to our own, and be free from the threat of experimentation ! yes I have seen that study too. Sadly those who work in the field of biomedical research think very differently about these animals than primatologists/anthropologists. I was astounded by how one-sided the panel were in that presser, despite some of those saying they are experts in animal welfare. There was a fascinating report published recently which I will blog about tomorrow, about how human matter being placed into animals could create “Frankenstein” creatures with human characteristics. Not such a bad idea if it gives them a voice to say what they’re feeling. just had an interesting thought – supposing sometime in the future, the extinct other ‘human’ species, like neanderthal man, homo aferensis, etc, could be re-generated (‘jurassic park’ style), what measure could be used to determine the level of self-conciousness they possesed, since many would have some form of speech but not necessarily to the full extent we do? Well I’m no expert, but I guess scientists wouldn’t bother determining how to test for consciousness because they’re our evolutionary ancestors. Cop-out answer I know, but also hypothetically true. I could imagine however that extensive tests would probably be run to gauge how primitive this species of man is….and if they were unable to communicate fully, then they would probably be end up being treated in the same way as monkeys and apes. like the thought with that one Tim.